Ropes course. Underground. Sign me up! That is what I felt when I learned about Louisville Mega Cavern! When we travel, we are always on the hunt for the unusual and unique attractions and Louisville Mega Cavern is certainly one of them! We are going below Louisville! Mega Cavern has several different experiences so I am sure that one will catch your eye! These experiences include Mega Quest which is a ropes course, Mega Zips zip lining, Mega Tram tour and Mega Underground Bike Park. A lot to do. All underground. Under Louisville. My daughter is quite petite, so I was not sure we were quite ready for the zip lines yet. Yet, we wanted to do something active. So, we opted to try the ropes course and had quite a thrill! 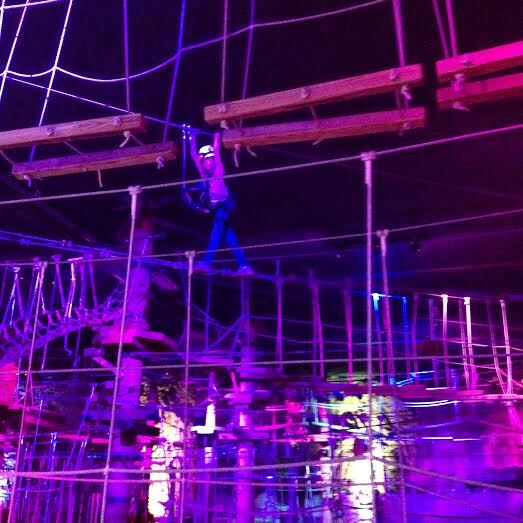 At first glance, the ropes course looks a bit daunting. We quickly found the course to be a fun and engaging challenge! Each participant is well equipped with safety equipment including clips. You are actively shown how to use them before embarking on the course and must always be clipped in to use the course. You do not have to follow a set path through the course and can complete the obstacles you choose. There are mini ziplines within the course but you can go in a different direction if you would like to avoid them. We saw people of all ages in the ropes course. Pretty fun! We also took the Mega Tram Tour while in the cavern. The tour was a great way to learn about the cavern and its history. Plus, the cool temperature of the cavern was welcome on a warm day! The tour was particularly interesting because the cavern began as a limestone quarry. All of the caverns I visited in the past had been naturally carved out. So, it was neat to see one mined out. We did learn a bit about the mining process, how supports are put in and more. We also learned that the cavern was briefly considered as a fallout shelter. There was an area where a mock shelter was put up. I love little historic tidbits! Additionally, we learned about recycling that can be done in the cavern and other ways caverns can be used while staying eco-friendly. We did learn a lot and my husband in particular loved the tour! If you are choosing between the ropes course and the tram tour, we definitely recommend the ropes course as a first choice. Overall, it was the more engaging experience and the one that has us ready to return! The Tram Tour is about 75 minutes and you have 3 hours on the ropes course though we were finished after about 1.5 hours. You can do both with a break in the middle to go out for a picnic lunch. The caverns have a year-round temperature of 58 degrees. While the temperature is pleasant, you may get warm while adventuring through the ropes course and may not need a jacket. You will need the jacket for the tram tour, though. Bring as little as possible with you inside because you will not be able to handle it on the course. There are lockers for a small fee. The Mega Cavern has snacks for purchase. However, there is a picnic area so if you will need a more sizable meal, I would suggest bringing a picnic. No outside food is permitted in the cavern. You can have birthday parties, corporate events and more at Mega Cavern. Talk about upping your coolness factor! The Gift Shop has quite the array of minerals and fossils to choose from. Lights Under Louisville is a Christmas light show held underground in the cavern. You actually get to drive through. The experience sounds amazing! Plan to arrive about 15 minutes before your scheduled time. I advise reserving your time in advance to avoid disappointment. The Mega Cavern is a bit tucked away so be on the lookout!